The technology consists of heating the wood at high temperature (from 190 to 240 °C) in an oven (autoclave) which has a controlled low oxygen atmosphere. The heating time and the degree of temperature sustained for a given time depends on the torrefied species and the desired colour. 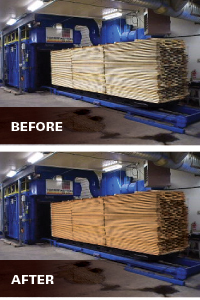 This technology requires pre-drying using conventional dryers, to lower the humidity of the wood to a moisture level between 6% and 10%. Thereafter, the torrefaction process lowers the moisture content to 0 %. Finally, the wood is introduced into a conditioning chamber where its temperature is gradually reduced thanks to the controlled injection of water vapour. The moisture content of the material is brought back to 3% to 6%, in order to give the wood its natural flexibility back. This stabilizes the wood and allows better quality woodworking. Torrefied wood does not contain any chemical products that could contaminate air, water, and soil. It is perfectly safe for the health of users. Torrefaction caramelizes the wood, giving it a honey blonde to dark brown shade, depending on the treatment applied. In addition, the treatment emphasizes the wood grain. Torrefied wood retains greater dimensional stability when exposed to atmospheric changes. It has little tendency to shrink or warp due to temperature and humidity variations. Torrefied wood is more resistant to fungi and molds that mark and degrade the wood. The process largely destroys the cells on which insects and wood pests feed. Torrefied wood is therefore ready for outdoor applications and is as durable as cedar or chemically-treated wood. What’s more, it is not harmful to health. Torrefied wood can be transformed, in most cases, immediately after the heat treatment. Torrefaction does not make wood inert. Indeed, wood remains a living material. It is important to apply a good quality primer to protect it from UV rays and prevent greying of the wood. Although its resistance to water and organic degradation is very high, torrefied wood still requires a certain level of maintenance. Torrefied wood is a little less resistant to static bending and tearing than untreated wood. It may, depending on the species, be somewhat more brittle. However, this weakness is not significant for most species. Torrefied wood should not be used for structural purposes. The hardness of torrefied wood may require appropriate cutting tools. It can be moulded and worked while retaining its beauty, because the method allows a uniform color throughout its thickness and not only on the surface like chemically-treated wood. For gluing work, be sure to look up what kind of glue to use, as torrefied wood has a degree of humidity that is inferior to conventional wood.